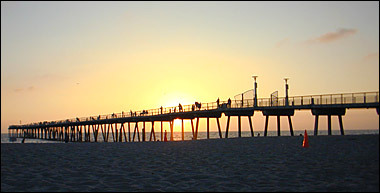 Hermosa Beach is located in Los Angeles County. As of the 2000 census, the city had a total population of 18,566. Segments of the television show The O.C. are actually filmed in Hermosa Beach, not Newport Beach, because of union rules that make it expensive to film outside of Los Angeles County. Hermosa Beach is an important center for American beach volleyball competitions. It is also the home of the world famous Comedy and Magic Club where Jay Leno performs every Sunday night. Fiesta Hermosa is an annual street festival that takes place every year on Memorial And Labor Day Weekends. In Spanish, the word "hermosa" means beautiful.